Quality policy | NAC-NAGAHORI INDUSTRY CO., LTD. is a quality manufacturer of Quick Couplings, Impact Sockets and Screwdriver Bits. NAGAHORI INDUSTRY CO., LTD. is a leading manufacturer of Quick Couplings, Impact Sockets and Screwdriver Bits. This is a page of quality policy. NAC/NAGAHORI INDUSTRY CO., LTD.'s quality control doesn't aim only at high quality of each products, but at utility and efficiency for end users. We here show you our quality policy. NAGAHORI INDUSTRY CO., LTD. through developing, producing and marketing "Connection" products, with the originality, aim to coexist with the society. NAGAHORI INDUSTRY CO., LTD. in obedience to ISO9001, made quality management system. Peaple in every sections of our company understand, practice and maintain it, and then continuously improve its effectiveness. Pursuit of production upon the request of end users. 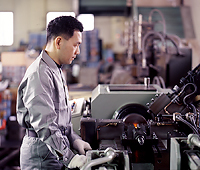 Contribution to customers' production efficiancy and enlargement ot their satisfaction.